Crisp mountain air, exercise that leaves muscles deliciously relaxed and a cozy fire-lit place to curl up with your honey are just a few perks of an active winter honeymoon. How lucky for Oregonians that a snowy mountaintop is never too far away and a fun alternative to a far-flung tropical locale. 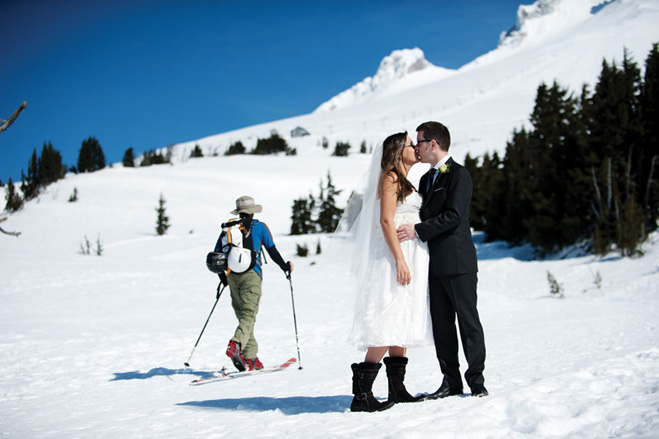 We’ve rounded up some of Oregon’s best snowy recreation areas within a wedding ring’s throw of romantic accommodations. Where to play: Just 22 miles outside of Bend, stellar cross-country skiing and snowshoeing trails begin at Dutchman Flat Sno-Park with dynamite views of Broken Top, Three Sisters and Mount Bachelor. Where to stay: In downtown Bend, the luxury Oxford Hotel caters to honeymooners with offerings such as romance packages and beautiful hot tub and sauna facilities. Insider tip: They have a pillow menu. Use it! It’s your honeymoon. Where to play: In the Umpqua National Forest about an hour and a half from Roseburg, seven miles of groomed trails and backcountry trails snake around Diamond Lake. Where to stay: A scenic two-hour drive south from Diamond Lake leads to the historic town of Jacksonville. Check into the TouVelle House, a restored craftsman-style, six-room B&B with period antiques, a curated art collection and seriously luxurious bed linens. Ask to visit Lewis and Clark, the resident charming pug duo. Where to play: For a robust adventure that requires some experience in backcountry snow travel, ski or snowshoe to a fire lookout in Mount Hood National Forest. From Billy Bob Sno-Park on the east side of Mount Hood, the Five Mile Butte and Flagpoint Fire Lookouts can be accessed via groomed and backcountry trails. Where to stay: The Forest Service rents fire towers in the winter off-season. Accommodations are rustic and require backpacking in your own food and sleeping bags. This requires a bit more work and planning than a posh hotel visit, but cuddling next to a wood burning stove in a room of windows with a 360-degree volcano view more than makes up for the trouble. Alternatively, stay at the adorable and historic 19-room Balch Hotel 18 miles away from Billy Bob Sno-Park in Dufur.